Questions are being asked about whether Winston Peters is fit for purpose as Deputy Prime Minister and Minister of Foreign Affairs, after ‘deep contemplation’ (dozing on the job) being recorded on a number of occasions. Foreign Minister Winston Peters is deflecting claims he fell asleep in a meeting of top Islamic leaders in Turkey over the weekend. This happened while Turkish President Recep Erdogan was speaking at the event. Peters had been requested to attend the conference by Turkish officials to discuss the terror attacks in Christchurch. It was a quick trip to Turkey, so jet lag may have been a factor. “This is amazing,” Peters said when asked if he had nodded off at the meeting. He said it was a “very, very serious meeting and that’s why I still have a record of it”. Ministers are regularly given run sheets prior to meetings, which contain the names those in attendance and an agenda. Claiming to have a list of speakers is a lame explanation. “Some would suggest that you could be in deep contemplation and know what is going on at the same time, which I was,” Peters said. He did not, however, deny being asleep. There were other times recently where Peters has looked to be in deep contemplation. Last week, Peters sat with his eyes closed and his head down at times while Prime Minister Jacinda Ardern and a contingent of Ministers and MPs met Muslim community leaders following the mosque terror attacks in Christchurch. A few weeks before that, Peters’ eyes were closed during a Security and Intelligence select committee hearing, also attended by Ardern. The prime minister, unimpressed with Turkey’s portrayal of New Zealand’s day of suffering, said her foreign minister would be confronting the offensive comments of Turkey’s president Recep Tayyip Erdogan during a visit to that country. In Winston Peters’ own words, he was going there to “put the record straight”. He now says he believes some progress has been made as Erdogan is using a smaller portion of the clip. He had got an assurance on safety and the president had toned down the campaigning. Peters’ approach contrasts with the strong language of Australian Prime Minister Scott Morrison against his Turkish counterpart. 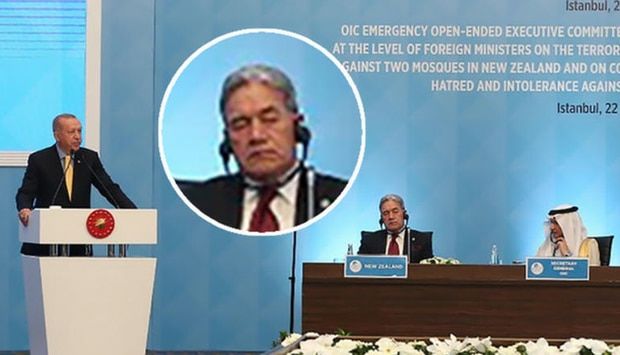 There is, of course, another image: Peters apparently dozing at the Organisation of Islamic Co-operation forum while Erdogan addresses New Zealand’s response to the shootings. It is a picture of Peters asleep at the wheel of this country’s foreign affairs. At a key point in the nation’s history. It was particularly bad timing for the NZ First leader. Peters, meanwhile, has appeared undermined and partially silenced by his own troublesome anti-immigration commentary. He needed to perform and display strength in Turkey, not only on behalf of his fellow countrymen and women but also, perhaps, for the prospects of a party with immigration as a principal theme. Peters’ issue with deep contemplation is not recent. When his former National Party colleagues wanted to wound him most, they would recount tales of Peters dozing off in Cabinet meetings or of him not reading Cabinet papers. The difference between then and now is that Peters is under a lot more scrutiny. His rise in political power has coincided with an era in which cameras are everywhere. Big brother has been joined by sister, mother, cousin, aunt, uncle, friend, foe, citizen and journalist. Given the importance of the mission to rescue New Zealand’s reputation among Muslim countries (and ultimately the safety of Kiwis) it was inexcusable but it was not surprising given that Peters arrived in Istanbul 5.30am after flying overnight, had a full day at the conference and left at 2am. Peters was away from New Zealand for five nights on the trip to Indonesia and Istanbul but had only two nights on the ground. It was perhaps the most punishing of his punishing schedules in this, his second stint as Foreign Minister. Peters’ frequent state of deep contemplation is sometimes excused on the grounds that he is getting on in years – but he is not such a rarity. The frequency of recent events has made it a public issue. Peters has discipline when he cares to exercise it. He cannot afford repetitions, lest he be seen as not fit for purpose. Jacinda Ardern sent Peters on the gruelling trip to Turkey, in the heat of the Christchurch shooting aftermath. She may need to think more about what Peters is capable of doing. Peters will be under ongoing scrutiny at public events, and it is likely any nodding off will be photographed and publicised. We’ve all dozed off for a minute with that. It’s all but impossible not to.Your body takes over. I once dropped off in a restaurant. He flies at the front of the plane, is whisked through security to a chauffeur driven car to a 5 star hotel he should be able to get through a meeting without falling asleep. Unfortunately he is the only thing between us and Ardern and Shaw wrecking the joint so lets hope we can keep him upright for another 18 months to veto the more crazy ideas. Point of order. The member should know the Green Parrot is now defunct. The best advice I ever had was to force myself to stay awake until night, even if it’s a really early night. The one time I didn’t and was persuaded to have a zizz in the afternoon, I was really stuffed; exhausted in the day, couldn’t sleep at night. It went on for ages.Never again. Even if you go to bed at 8pm, your body will think it’s bedtime. I have never had jetlag since I made myself stay up until night. I don’t remember the Green Parrot selling liquor. Rubbish, those lie flat beds, the chef taking your meal order, the good wines, attentive service, the lounge etc. one bounces off the plane in excellent fettle. Well if being upgraded doesn’t work, maybe all those who upgrade on our tax money could travel down the back with the rest of us. It being said that being upgraded was so they can approach meetings fresh. The Green Parrot isn’t defunct and it’s still a restaurant, not a pub. I think it would be a fair question to ask if you are awake when you post, Lurchy? Why ? Are you ? or are you dreaming and unable to tell dreams from reality ? be written on a pin head with a yard broom. Yet National and NZF voters have fallen for his blather 4 decades. promising sweet dreams yet delivering nightmares. But National + NZF voters still fall for his sleep inducing hypnosis. You appear to not be aware of who he is in government with, and how little National offered him at the last election. You seem to be unaware how National voters believed the polls and were convinced they would sleep walk to victory. You also seem to be unaware how hacked off National party voters are because Peters went with Labour. To be fair you seem to be in dream land with all your comments. Sleeping on the job as usual. Sitting duck you always are. You must move in different circles. The slug was telling everyone Winston would only go blue, despite the fact he had gone with Labour before. But he’s not known for accuracy is he? I have only heard relief and thankfulness that National did not form a government with NZF. “Dodged a bullet” is the common refrain. This has come from National MP’s as well, and was mentioned in Chris Finlayson’s farewell speech. National have hardly been working overtime to ingratiate themselves with NZF since the election either. I get the feeling you only hear about how hacked off National are from your Labour and leftist friends. After Peters went with Labour the Ngashing of teeth and shrieking wails of woe from the blues was palpable. Maybe being duped by Winnie has seen you develop selective memory of the events to try and ease the pain with this cods wallop about how good it is not to be with NZF. Hmmm. Once again, a different realty. But you keep doping you Finbaar. Also, see reply to Duker below. They would be interested in most of his caucus- thats what happened last time. if national were really really not interested in NZF all they had to do was rule out Peters after the results came in. Politics was art of possible and Finlayson had his 4 terms in parliament so could afford to be high and mighty, the rest of the caucus I can guarantee would be far hungrier for staying in office. National wanted to get back into to government, but it is very clear they did not offer Winston and his crew even a fraction of what Labour did, and they did not seem overly cut up with the resulting agreement with Labour. If anything they made bigger overtures to the Greens. They were definitely upset that as the largest party they did not form the government, which shows a mindset that hasn’t quite caught up with MMP. But the NZF aspect they were only ever lukewarm on and even showed some relief on when he went the other way. Their policys were far more aligned so an agreement was easier. We dont know what was in nationals agreement , only vague notions. Those ones that were relieved wouldnt be people like Joyce , Bridges, Bennett, and probably English too. “Pressure from the National Party organisation appears to have been influential in persuading the National negotiating team not to make any concessions to NZ First during the government formation talks. POLITIK understands that the NZ First team were surprised by how little National was prepared to give in the talks regarding policy. Altogether it looks like National were determined to not give anything away to NZ First even if that meant going into opposition. hes getting old, not as sharp as he used to be, hopefully its his last term, problem is NZF support without him, he needs visible likeable replacements, shane jones doesnt cut it. Tracy Martin, in my opinion she seems to be their best performer by any metric other than blow hard publicity. That’s not deep concentration; I close my eyes when I am really concentrating (like trying to remember details) but my head’s not slumped down, and when I see someone else doing it, they also frown a little and do things that make it obvious that they’re awake. To be fair we all nod off in meetings. Who can say they never did? Mind you deep contemplation is now the go to phrase.